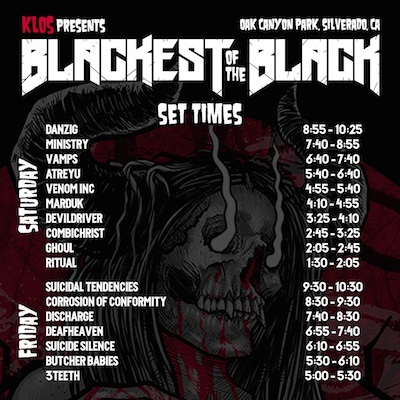 Band performance times have been announced for the highly anticipated KLOS Presents Blackest Of The Black Destination Festival, coming to Oak Canyon Park in Silverado, CA in Orange County this Memorial Day Weekend, Friday, May 26th and Saturday, May 27th. The brainchild of Glenn Danzig, the event not only serves as a music festival, but as a cultural experience: an escape. The festival will be hosted by Full Metal Jackie and will feature camping, along with a number of sinister attractions, and two music stages curated by Danzig. The festival has also announced Blackest After Dark: an exclusive after party that will be held on the Blackest Of The Black festival grounds. The event will serve as a listening party for Danzig's new album Black Laden Crown, which will be spun in full, as well as heavy music from KLOS. Kicking off at 10:30 p.m. and lasting late into the night, the carnival rides and bar will remain open for the duration of the party. Admission to Blackest After Dark is included in Friday's festival admission. Glenn Danzig's comic book company Verotik will be hosting special signings at their booth during the festival, including signings from Danzig himself, only on Friday, May 26th. Additionally, award-winning comic book artist Simon Bisley will be signing on both nights of the festival, Friday, May 26th and Saturday, May 27th. Information on tickets, VIP packages, camping and more can be found at www.BlackestFest.com. Please note that festival admission is not included with camping spots. Blackest Of The Black is produced by Synergy Global Entertainment (SGE), and presented by KLOS 95.5 FM. Sponsors for Blackest Of The Black include Modelo, Rockstar Energy Drink, Cosmic Fog, Musicians Institute, Blackcraft Whiskey, SlideBar, and more. KLOS The Rock of Southern California (95.5 FM) is a commercial Rock music formatted radio station in Southern California broadcasting to Los Angeles, Ventura, Riverside, San Bernardino, and Orange Counties. KLOS features specialty music shows such as Full Metal Jackie's Whiplash — Frosty, Heidi & Frank — Jonesy's Jukebox — Check I…2, and many more. Owned by Cumulus Media, KLOS studios are in Culver City, CA and the station reaches an audience of over 2 million listeners each week.